Caravan or Motorhome? It's an excellent question and one three different people have asked me this week! Mr WB was bought up with caravans and his formative years were spent in a field listening to his parents set up EVERYTHING they had bought. We never considered caravans, as we always knew we wanted to tow our motorbikes. Still, if we hadn't had the bikes, would we have made a different choice? Firstly, let's cover some basic questions so we're all on the same page. What is the difference between a caravan and a motorhome? Is a Motorhome more expensive than a caravan? How much does a motorhome cost? Are motorhomes in Europe cheaper? Caravan or Motorhome for UK camping? Is a caravan or motorhome better for touring Europe? Can you wild camp with a caravan? Is a Motorhome the same as an RV? Can you tow a car with a motorhome? Fine- that's a lot of information, but how do I CHOOSE between a motorhome or a caravan?? How did we choose between a caravan and a motorhome? How else can I help you today? HELP! I have condensation in my van. How can I fix it? I want FREE checklists, PDFs and itinerary guides- GIMME! 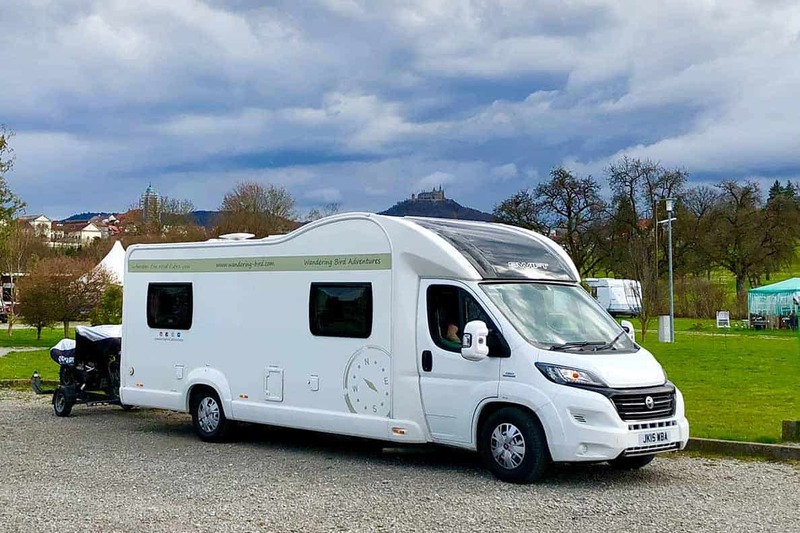 Conversely, a motorhome is like a car and a caravan combined into one unit, so you can normally get from the driver seats to the living/ sleeping area without having to go outside. To add to the confusion, the legal term for a motorhome is ‘Motor Caravan'!! The short answer is yes. A 6.5m motorhome will cost you more than a 6.5m caravan. It will probably cost more than a 6.5m caravan plus a nice car to pull it with! 🙂 Obviously, this is entirely dependant on the motorhome and the caravan/ car… but if you're looking to save money, a caravan might be a better option. You will also save money on MOT, vehicle tax, tolls, insurance and potentially storage, although again this is subjective. There isn't ONE best motorhome, and there isn't ONE price for them. It's exactly like buying a car- lots of styles, shapes, sizes and personal preferences. I'm reluctant to put any price down because the market changes so rapidly and there will also always be a reader who managed to get an incredible deal and disagrees with everything I say! So, I'll tell you what we paid. Our first motorhome, bought in May 2017, was a 2004 McLouis Tandy, fairly high-mileage (around 50,000 I think), 6.5m, overcab bed and fixed end bunk beds. We paid around £17,000 for it and sold it 6 months later, with an extra 12,000 miles on the clock, for £16,000. Our new motorhome is a 2015 model Swift, with much lower mileage and in better condition. We paid around double the cost of our old van (we got an excellent deal as I think that was below market price.) No idea what it's worth now, especially with the unique wrap and the hydraulic legs- I'll let you know if we ever decide to sell it! Motorhome or caravan- which is best for you? Nope. For our second van, we looked for a LHD, European motorhome and were shocked to find they were actually more expensive and well outside our price range. Again, you might well be able to find a decent deal somewhere, but in general, the UK is cheaper… especially at the current exchange rate! Advice for new Motorhome & Campervan Owners - A step by step guide for your first trip! A new caravan often costs as little as a used, old motorhome. So if having something brand new is important to you, that might be a better option. Also, if you're only going to use this for a couple of weeks each year, a caravan will probably be cheaper in the long-run. Sadly, as the UK lacks decent aires/ motorhome parking spaces (except for Scotland! ), it makes very little difference whether you choose a caravan or motorhome as you will spend most of your time on a campsite or CL site anyway. So, if you're planning to stay entirely within the UK, the choice is all yours!! You can tour Europe with either a caravan or motorhome and many people do just that. However, if you plan to wild camp, or use aires across Europe, you'll find many are suitable only for Motorhomes. Indeed, sometimes caravans are banned. For this reason, a motorhome is our preference. get a motorhome which is capable of having a tow-bar fitted. Surprisingly, not ALL models are. Check you are allowed to drive the motorhome (on its own) and also that you are allowed to tow the weight of the motorhome/ potential vehicle. The rules changed in 2013- you can check what you are allowed to drive on the gov website here. Motorhome versus caravan- which is better for you? How do you want to spend time in your vehicle? Do you want to be mainly on campsites, or out in the wilds? Do you want to stay in one place for a week and explore by car, or move more frequently? How long do you travel for? Can you drive whichever vehicle you want to buy? For us, we knew we wanted to tow the motorbikes. We also knew we wanted to explore with the motorhome, and we wanted to avoid campsites as much as possible. We didn't want anything too long, but we needed space for 3 of us to spread out and not drive each other crazy. Our teenager needed a separate space and we also wanted a dinette area so we had a proper table. Our first motorhome was utterly wrong for us in nearly every way- except for the fact that it was a motorhome! We knew that was the right choice for us. Even without the motorbikes, we'd still pick motorhoming- we enjoy the freedom and flexibility it offers. If you're not sure, I strongly recommend hiring one of each and seeing which lifestyle you prefer! How about you? Do you have a caravan or a motorhome? Which would you like to have?